Ducks Unlimited is making a difference for waterfowl and the future of waterfowl hunting traditions, but our work is never done. 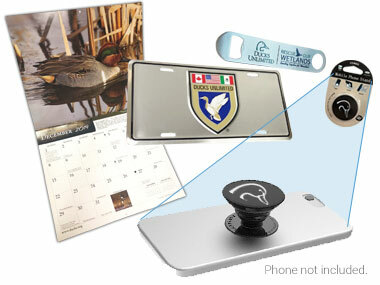 With your year-end, tax-deductible donation, you’ll make a difference AND receive a gift below as a token of our thanks! 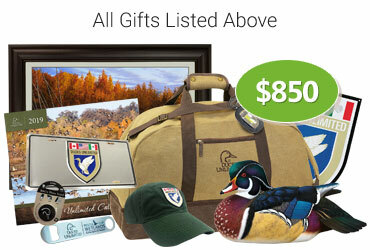 Your gift to Ducks Unlimited will help conserve and protect threatened waterfowl habitat throughout North America. 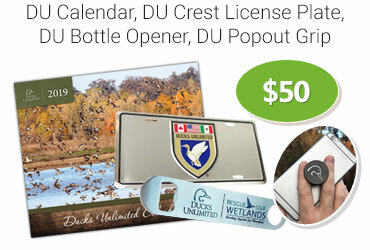 Through conservation efforts, DU is committed to filling the skies with waterfowl today, tomorrow and forever. Although great strides have been made during the last year, threats to waterfowl habitat and our hunting traditions remain. We won’t stop fighting these threats and we hope you won’t, either. Your donation will make a difference and strengthen our ability to address these challenges. Donate today and your gift to DU can multiply—up to four times—in matching funds! All gifts are appreciated. However, if you donate $50 or more we'll send you one of the items below as our gift to you. Thank you for your generous support. Donate today and your gift to DU can multiply—up to four times—in matching funds! All gifts are appreciated. However, if you donate $50 or more we'll send you one of the items below as our gift to you. 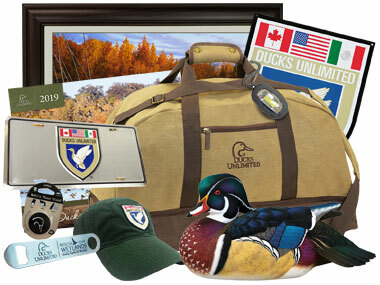 DU 2018 Calendar - The 13" x 22" premium version of the DU 12-month calendar features beautiful, high-quality photography by some of Ducks Unlimited's most talented members, with plenty of large-size grid pages to record all of your important dates. DU Crest License Plate - Show your support with the DU Crest License Plate. 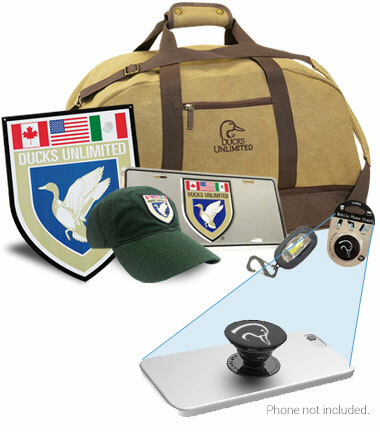 Satin finished aluminum license plate embossed with a full color Ducks Unlimited Crest logo on silver. The plate measures 6" x 11 3/4". 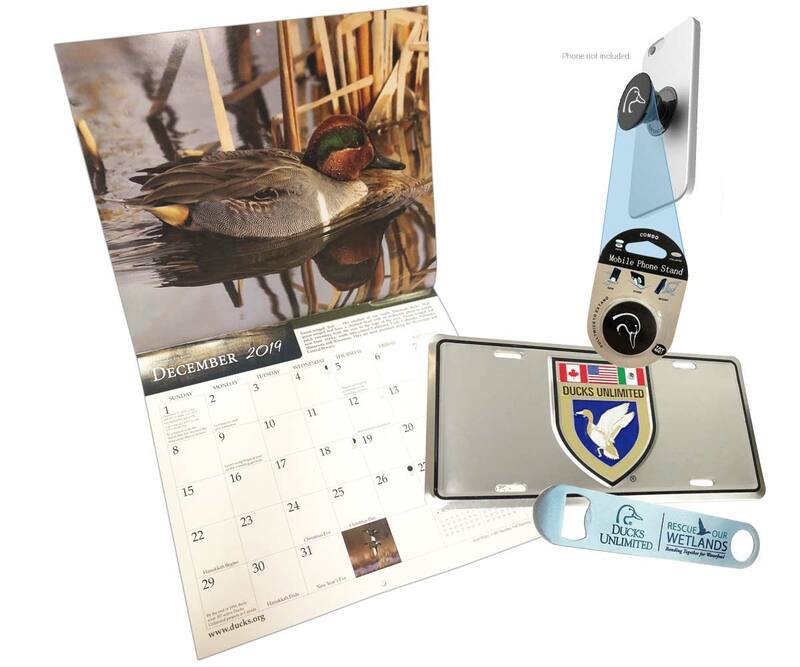 "Rescue Our Wetlands" Bottle Opener - Classic, flat, stainless-steel bottle opener with Ducks Unlimited and "Rescue Our Wetlands" logo imprinted on front. Extra length provides better leverage. Measures 5 3/4" x 1 1/4" x 1/2". DU Phone Popout Grip - Make holding devices more comfortable and secure with the DU phone popout grip. The expanding grip and stand mounds easily to most phones, tablets, and cases. The popout grip is black with DU logo in white and measures 1 1/2" in diameter. 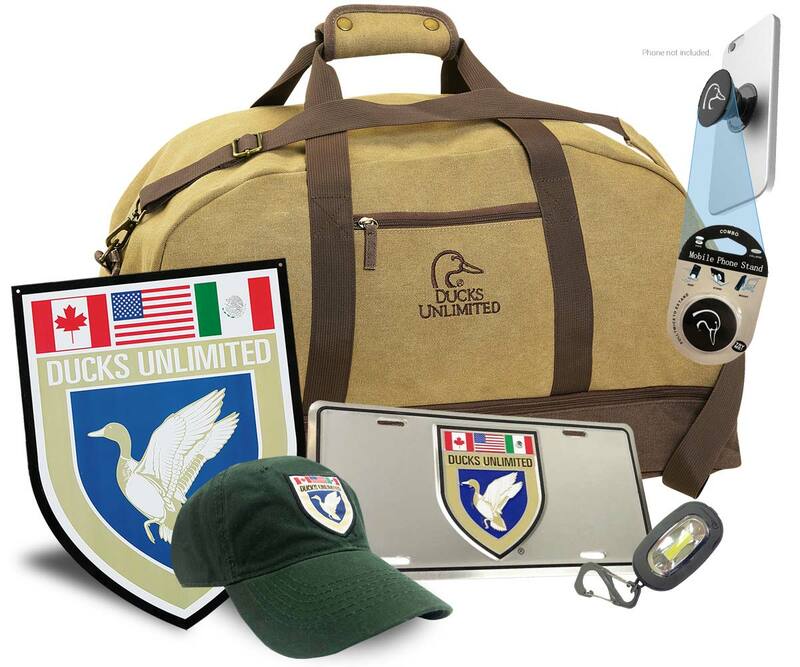 DU Cotton Canvas Duffel Bag - Whether heading to the field, a weekend getaway, or to the gym, this new, top-quality canvas duffel is sure to become your bag of choice. This rugged two-tone brown duffel is outfitted with brass hardware, a comfortable padded shoulder strap, and carry handles. The bottom also features a separate lined storage area for muddy boots, wet socks, or workout gear. Measures 23" L x 11.25" W x 13.5" D.
DU Crest Sign – Full color DU Crest Sign made of sturdy 1mm thick metal. Perfect to hang anywhere. Measures 9 3/4" x 12 1/2". 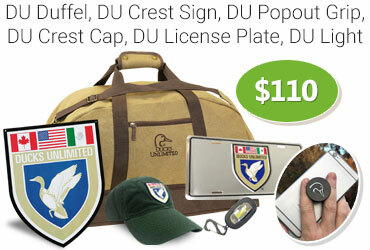 DU Crest Cap - Hunter green cap with a full color DU crest patch and Velcro closure. One size fits most. DU Blind Bag Light - Hanging clip light with bright LED bulb can be used anywhere you need light when duck hunting. Features regular and strobe light options. Includes a magnet on the back, a double-end clip, DU logo on front, and three AAA batteries. 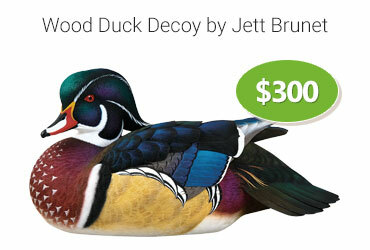 Jett Brunet is one of the world’s most distinguished waterfowl carvers. Brunet won his first world championship at the age of 21. 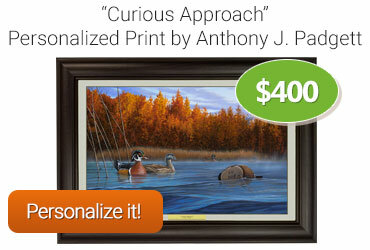 Measures 12 1/2" x 6 1/2" x 7"
In "Curious Approach", Anthony J. Padgett, former DU International Artist of the Year, captures the importance of wetlands conservation in this autumn scene with a couple of Wood Ducks. Near the marsh’s edge, the curious pair gets closer to inspect one of the decoys sharing the same body of water. The vibrant colors of autumn provide the perfect backdrop for one of the most striking species of waterfowl in North America. 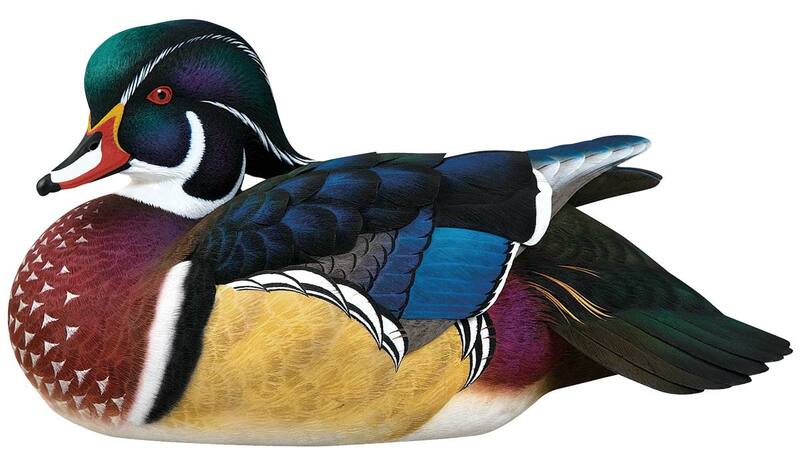 The Wood Duck is a prime example of how wetland conservation can enable a once threatened species to thrive. 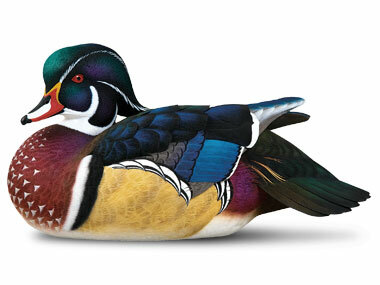 From its lowest numbers near the turn of the century, the wood duck has rebounded to a strong and flourishing population. 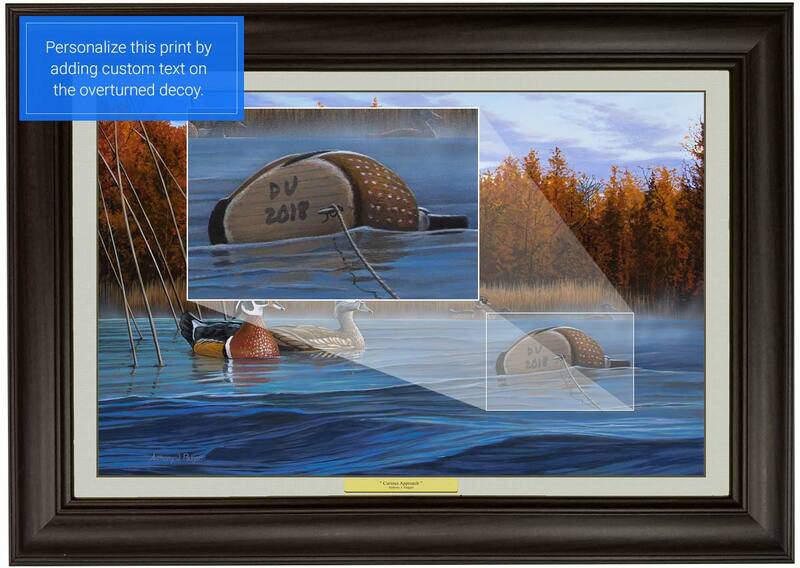 Make this canvas print truly yours with the personalization option of placing simple text in the artwork on the overturned decoy. 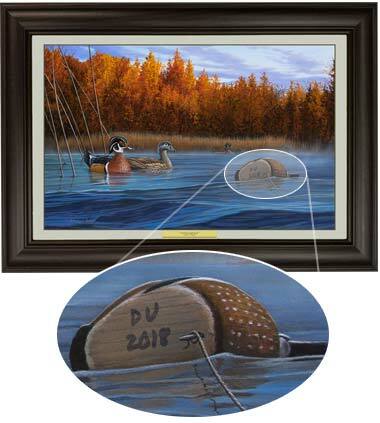 Family, club, and farm names, are a few examples of how personalization can make the artwork uniquely yours. Proudly made in the U.S.A. the canvas print has an image size of 20" x 30" and is framed with a 2 3/4"" Brazilian Walnut finished molding giving it an overall size of 25 1/2" x 35 1/2". *Please note: You will receive a separate email to complete customization and personalization of the canvas once your transaction is complete. Please be sure and fill out this information in 7-10 days to ensure receipt of your framed canvas. 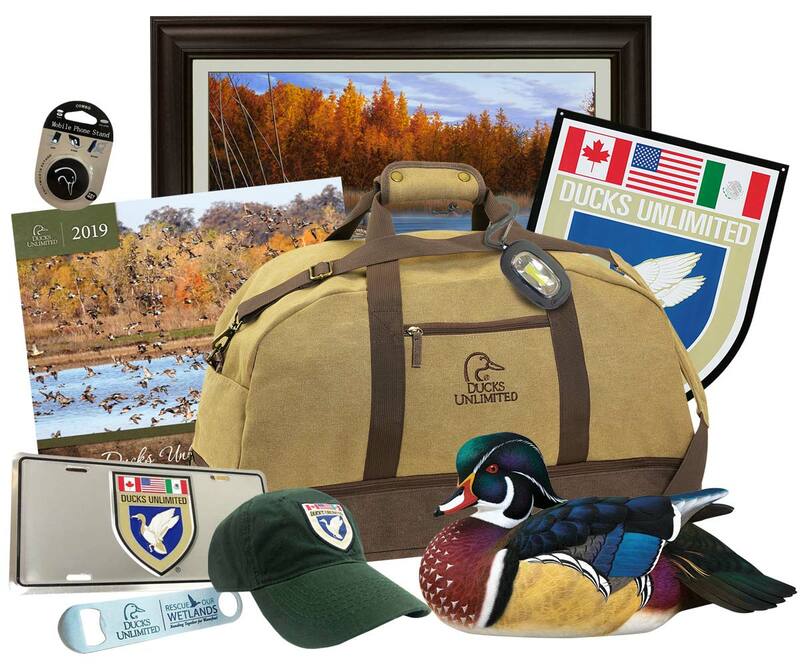 All Items without Gun - including 2019 Calendar, License Plate, Bottle Opener, Phone Popout Grip, Cotton Canvas Duffel, DU Crest Sign, DU Crest Cap, Blind Bag Light, Wood Duck Decoy and "Curious Approach" personalized canvas! View detailed information on each item by selecting "view details" individually. 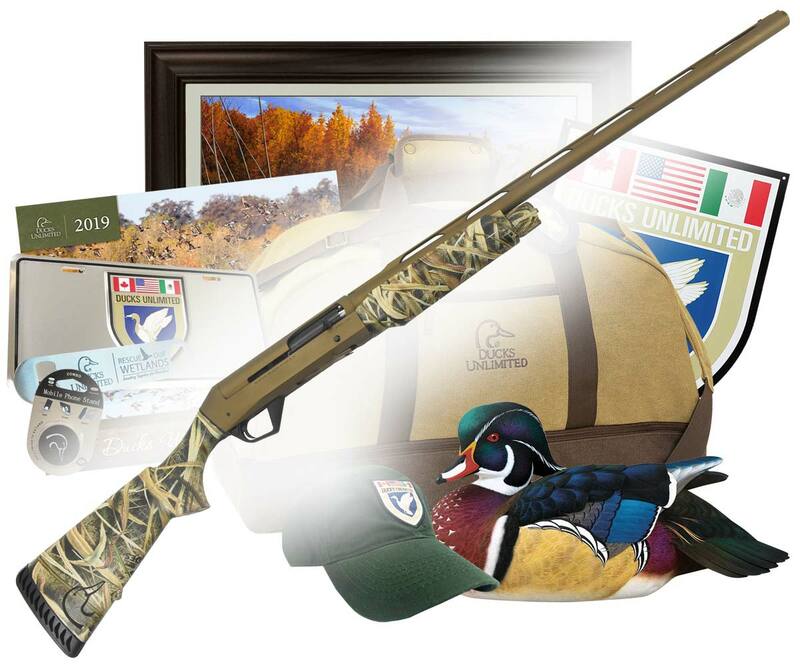 All Items AND Benelli SBE II Classic Shotgun - including 2019 Calendar, License Plate, Bottle Opener, Phone Popout Grip, Cotton Canvas Duffel, DU Crest Sign, DU Crest Cap, Blind Bag Light, Wood Duck Decoy and "Curious Approach" personalized canvas! 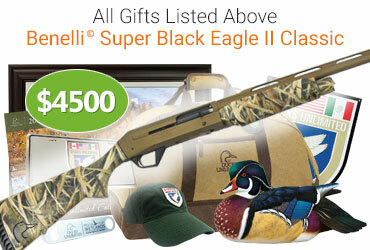 Benelli Super Black Eagle II Classic Shotgun - Benelli design engineers have focused on three areas of critical importance to the serious waterfowler: Improved ergonomics, intuitive, flawless functionality and an updated design, style and feel for the latest in modern waterfowling reliability that's all about the end game - absolute superiority in the most unforgiving conditions. *Firearms are subject to all federal, state and local laws. The gun must be shipped to a FFL dealer designated by donor and will be released to donor once background checks have been successfully completed. *You must donate by Dec. 4 to guarantee delivery of gifts before Christmas. 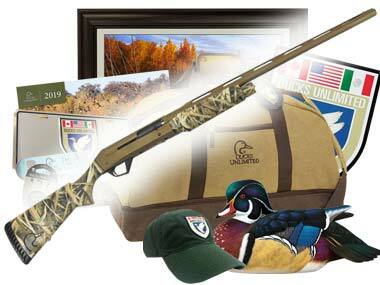 *Because Ducks Unlimited, Inc. is a 501(c)(3) charity any amount you donate, minus the value of the gifts received ($1,750 for this package), before Dec. 31 may be deductible for 2018 income tax purposes. Please see your tax advisor for actual deducibility. For more detailed information – select “view details” under each individual item. For questions or to donate by phone please call 1-800-453-8257.